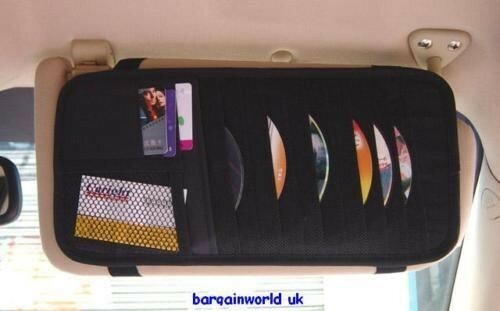 HIGH QUALITY VISOR ORGANISER CAR / VAN / CARAVAN / LORRY VISOR ORGANISER WITH ELASTICATED HOLD FLAP BUILT IN SIMPLY CLIP ON BEHIND YOUR CAR SUN VISOR FOR PASSENGER OR DRIVER SIDE (OR BOTH) USE TO ORGANISE YOUR - CDS - BUSINESS CARDS - PARKING RECEIPTS - MEMOS - TELEPHONE NUMBERS - EMERGENCY USE MONEY NOTE/COINS AMAZINGLY USEFUL ITEM A MUST FOR EVERY CAR SUPERB NEW IDEA WHY NOT BUY TWO AT A POSTAL DISCOUNT!! FREE POSTAGE ON 2ND OR MORE ITEMS! BUY A FEW FOR GIFTS TO FRIENDS / FAMILY ORGANISE YOUR CAR - DONT STUFF EVERYTHING IN YOUR GLOVE BOX! KEEP THINGS OUT OF SIGHT OF THIEVES STOPS CDS FROM SCRATCHING - OFFERS EASY ACCESS - VIEW THE EDGE OF YOUR CD SO NO NEED TO PULL IT OUT EVERY TIME!